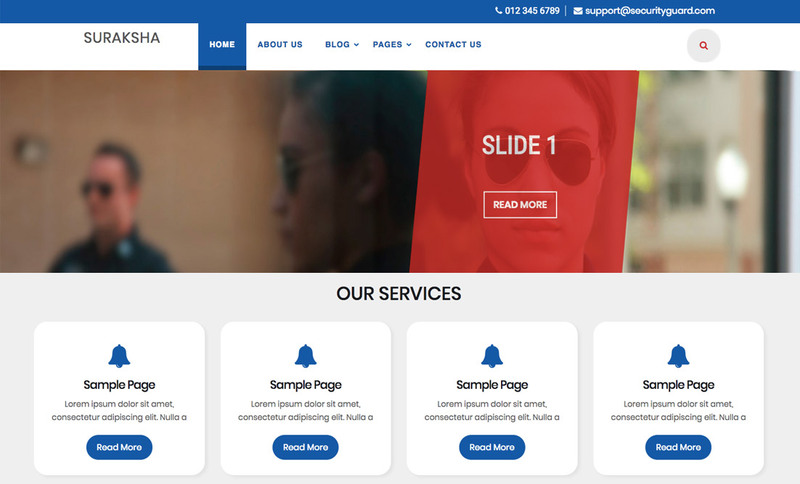 Suraksha Security Guard WordPress theme is a bold and powerful theme inviting people into taking your security services. It is specially designed for companies and agencies doing business in security services like providing security guards, bodyguards, commando training institutes, self-defence classes and other such businesses. This theme comes with all the exclusive features and functionality to make it performance efficient in all respect. It is essentially made responsive by building it on Bootstrap framework giving good look on mobiles, tablets, ipads and desktops. Bootstrap also makes the site easy and handy to use. It is cross-browser compatible and highly customizable. This premium security guard WordPress theme has been made translation ready to serve a particular audience. It has unlimited slides and multiple page and blog layouts to craft out a site of your imagination. With limitless colours and numerous Google Fonts option, you can very well try different looks for your site. It is written in clean and secure codes to match WordPress standards. The theme has several custom post types like gallery, testimonial section, subscription area, latest news etc. to make your site more informative and beautiful at the same time. This premium security guard theme has social media icons embedded to make your site famous.